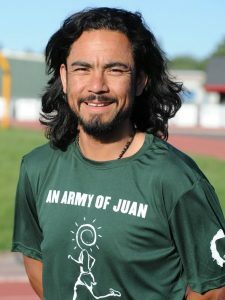 Juan “Army of Juan” De Oliva, has finished the 178-mile Reno-Tahoe Odyssey by himself. The race is typically done by teams of up to 12 runners. A few teams were done with the run before noon, with other teams expected at the downtown Reno finish line throughout the day. He finished the course in 46 hours and 20 minutes. De Oliva began his one-man race on Thursday, one day earlier than the rest of the runners, who started Friday. MORNING UPDATE: Late on Saturday morning, runners were nearing the end of the 178-mile Reno-Tahoe Odyssey. One runner, Juan De Oliva, has been the talk of the race — he’s doing it solo. As of 11:30 a.m. Saturday, De Oliva was on pace to finish his 178-mile trek around 3 p.m. today, said Ryan Evans, assistant race director. A few teams were done with the run before noon, with other teams expected at the downtown Reno finish line throughout the day. De Oliva began his one-man race on Thursday, one day earlier than the rest of the runners, who started Friday. As of 3 p.m. Friday, he was nearing the 100-mile mark. Michael Connors, the founder and co-owner of Reno Running and Fitness, said on Friday afternoon that De Oliva looks strong and also is feeling great. Usually, teams of up to 12 runners participate in the relay race that starts and finishes in downtown Reno, runs through the Sierra and along Lake Tahoe and through several Northern Nevada landmarks.